Description: This stamp is made by The River City Rubber Works Company. This is a Solid Awareness Ribbon. Stamp it in Pink, Yellow, Green or which ever color is the color of what you believe in!! A must have for every stamp collection!! Description: This stamp is made by The River City Rubber Works Company. This is an Open Awareness Ribbon. Stamp it in Black and then color it Pink, Yellow, Green or which ever color is the color of what you believe in!! A must have for every stamp collection!! Description: This is a stamp from Hero Arts. Called Old French Writing, it features writing that would make a terrific background effect. Description: This stamp is from All Night Media. It is a Smiley Face and since you are here at www.stamp-happy.com, you know I LOVE the Smileys!! Description: From Hero Arts comes set of 18 stamps called: Lots Of Dots. Each stamp has a different image shown at right. You also get 2 mini ink pads in Blue and Pink. Description: From Hero Arts comes this New Address stamp. If you are moving and need to tell your friends and family, use this stamp to make a cute card!! Description: This is a nice fun stamp from The River City Rubber Works Company. It is a Crowd of Hands. It is perfect when used with RS1424 the saying that reads: The Crowd Goes Wild. Description: This is a fun stamp that can really be used for almost anything. It is the Small Swoosh stamp made by Stampington & Company. Description: This Medium Undecorated Fan stamp is made by Stampington & Company. You can do so many things with this but how about using this as a fan!! Stamp, Cut the layers, String some ribbon through the holes you will punch and voila!! 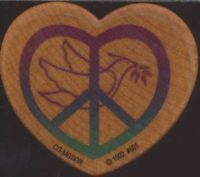 Size: 5 1/4" x 3 1/8"
Description: This stamp is from Hero Arts. It would look great in water color. Goes great with floral stamps. This is part of the garden wisdom collection. Description: This Smiley comes from All Night Media. 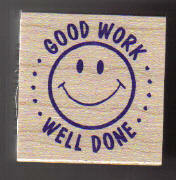 Great stamp for school teachers and parents. Description: This stamp comes from Inkdinkado. It is an outlined Ribbon of Hope rubber stamp. You can personalize in any color of your choice. Perfect size for handcrafting! 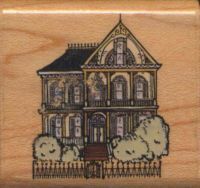 Size: Image size is 1 1/4" X 1 1/4"
Description: This is called "Victorian House #1 Stamp" and is very detailed. It is small and good for notecards or even in the background of a scary Halloween greeting card. 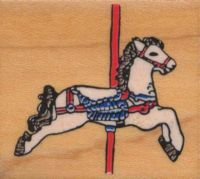 Size: Image size is 1 1/8" x 1 1/4"
Description: This is a cute little corousel horse wood mounted rubber stamp. Perfect for all those carousel horse lovers and collectors! Size: Image size is 1 3/8" x 1 3/8"
Description: This stamp from River City Rubber Works is a favorite for the cook of the family. You can create your own recipe cards and create your own recipe collection. 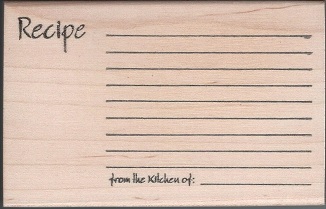 The stamp says "Recipe" at the top with lines for hand writing your recipe detail. At the bottom it says "From the kitchen of:" so you can make it personal. A hand written recipe is special! Size: Image size is 4 1/2" x 2 1/2"